If you are scouring the net in order to find the best rollator for the money, we are here to help. After examining what the specialists had to say on this topic and after reading reviews of the available models, we have concluded that the Drive Medical Four Wheel is the product that you should consider investing in. This device can provide its user with support and comfort, and it is perfect when used on both uneven and outdoor terrain. Besides, the model includes safety features such as loop locks as well as a padded seat and a basket where one can place any additional personal belongings that one might need when out for a walk. If the product that we have talked about is out of stock, feel free to check out the Hugo Elite Rollator as it is an equally reliable item. One of the most user-friendly features that this model comes with is its convenient basket that you can use to place several belongings as you’re out and about. It also boasts non-marking wheels, as well as deluxe loop locks. Because it can be used on virtually any type of terrain, this item is definitely versatile. The built-in padded seat comes with a backrest included. If you are in the market for a walker for someone who is taller than 5’10”, this one might not be suitable. This rollator is stable, versatile, and efficient and it gets the job done precisely as it should. With the ergonomic grips and adjustable hand bars that this product comes with, you will have no problem using it and even customizing it as per your needs. The device comes equipped with a backrest, as well as a convenient storage bag. The bag is located right under the seat, so you won’t really have to make an effort to place your belongings there. Besides, this product is foldable. You have to adjust the brakes after you assemble the product, and if you aren’t tech-savvy, that might be a con. A convenient rollator walker that comes with a backrest, a seat, as well as a saddle bag. What seems to make this unit stand out from the crowd is its lightweight design. You won’t have a lot of trouble handling the item since it comes with as many as six casters. The wheels are compatible with a broad range of terrains, so you can use the rollator both indoors and outdoors. The backrest is padded and removable, so you can customize the product as you want. Some customers note that this rollator doesn’t move easily over bumps, twigs or cracks that might be on the sidewalk. Even though it’s budget-friendly, this model is comfortable and can offer you the support you need. If you are determined to find the best rollator walker out there, but you do not know what models are worth your consideration, we recommend that you take a good look at the following list of items as they have received outstanding reviews from prior users. If you want to get one of those great granddad gifts, you should not overlook the model designed by Drive Medical. This item comes provided with non-marking wheels, deluxe loop locks that add extra safety to this device, and a small yet convenient basket for one’s belongings. Furthermore, this product is said to behave well even when used on uneven outdoor terrain, which is a reason why many consider it very versatile. On top of that, it is worth pointing out that this model is very comfortable, as it includes a built-in padded seat that has a backrest that supplies the user with extra support. Moreover, because this model has an adjustable handle, you should not worry about it not being fit for your needs. In fact, overall this unit has a handle height of 31-37″. Also, the seat that is included in its design was constructed out of plastic. Another model that is worthy of your time and money is the Hugo Elite Rollator. This product incorporates hand adjustable bars so that you can select the proper posture and it features ergonomic hand grips so that you can choose that perfect angle. What is more, the device comes fitted with backrest and with a convenient storage bag that is positioned under the seat. Therefore, you will be able to place all your necessary items in it before you go out for a walk. This product stands out because it was constructed in such a way so that one does not need special tools to assemble it. Besides, the model is easy to fold down and store in between uses. Also, the device can support adults that weigh up to 300 lbs. and it comes provided with 8-inch wheels that offer extra stability to the user when outdoors. If you want to acquire a unit that is extra lightweight, this model sold by Drive Medical might be just what you need. The product comes supplied with six casters that can be used both for inside and outside walks. Additionally, this device comes equipped with a padded removable backrest that you can use or not, in accordance with your needs. Furthermore, the product has handles that allow one to adjust their height and it is provided with a padded seat. However, if you would like more comfort, you can always invest in a convenient wheelchair cushion. For safety reasons, this model features loop locks. A standard pouch with zippers where you can safely keep your belongings is also included in the design of the item. Overall, according to prior users, the product is said to provide you with the necessary means for you to be able to enjoy the active lifestyle that you love. Another product that you should not ignore is the Drive Medical Nitro. This model is easy to collapse and, thus, not that tricky to fold in between uses. To do so, one has to pull the seat grip up and then just bring the two sides of the unit together until the handles almost touch each other. Even more so, the sophisticated design of the device incorporates a built-in brake cable that guarantees that you will be safe and protected at all times. Also, because this item is made of aluminum, you should not have issues carrying it and putting it in the back of your car. This product also features a nylon seat that is quite comfortable, as well as a height-adjustable handle so that the model satisfies your requirements. The large front seat that this model includes is said to add convenience. A zippered bag that you can use for storing belongings was also added to the model. Another feature-packed model that qualifies as one of those gifts for grandparents is the Medline Premium Empower. The device comes furnished with plenty of features that can help you enjoy your walkers. For instance, differently from other models, this unit has a practical cup holder and a tote bag that has been placed below the seat. A tray organizer and a reflective tape that makes the model visible to others has also been included in the design of the product. Furthermore, this item features a comfy seat that has been padded with memory foam where you can sit whenever you want to take a break. Also, if you do not want to use the seat, you can always lift it so that it won’t make it difficult for you to walk. Lastly, you should know that the item can support up to 300 lbs. and that it incorporates loop style brakes that are very practical, especially for the seniors that suffer from limited mobility. If you feel like your grandma needs something that can supply her with more support than her regular walking stick, check out the Drive Medical Nitro DLX. This model has an attractive design, and it has 10-inch front wheels that provide the users with perfect steering. What is more, this model was built in such a way so that its users find it effortless to fold the unit. As a result, you can easily store and transport it when moving from one place to another. Also, this item comes shipped with an included bag that one can attach to the product. By doing so, one will no longer have to hold his/her personal belongings in his/her hands. The model can sustain up to 300 lbs. and it also features back support and a convenient height adjustment so that the model can cater to all your needs, regardless of your height. Another model that you might like is the Drive Medical RTL10266-T. To adjust the height of this model, one has only to press a button. The unit is appropriate for all seniors that are 6 feet and above. Hence, your grandparents/parents won’t have difficulties operating it. As a plus, this device has back support and a unique design that is said to enhance turning radius. Also, the product is easy to fold when not used and effortless store. This model features a zippered, removable storage bag that you can use whenever you want to carry additional items with you. According to the manufacturer, the container is well secured to the unit for safety reasons. Moreover, because of its cross-brace design, the model can provide you with more support than most senior walkers, which is a reason why many prefer it. Overall, this unit has received positive reviews, and it is considered a great investment. This model is also worthy of your attention. The unit has a padded seat that is very comfortable, and it includes a very practical zippered pouch underneath it where you can keep your personal items. Besides, this unit features a hinged, padded backrest that can be folded up or down according to your needs. Also, the ergonomic hands incorporated in the design of this item are easy to grip and adjustable, so that you can modify their height whenever you feel necessary. Additionally, the product comes provided with 7.5-inch wheels that are great for both indoor and outdoor use. Last but not least, this device has effortless-to-utilize loop locks as well as breaks that have serrated edges that supply the user with a firm hold. The unit has a weight limit of 300 lbs. and has received overall good ratings. A vast majority of those that have purchased this item were also interested in wheelchair gloves. If you are set on getting a model that can be used by those seniors that have to maneuver diverse types of terrains and tight spaces, the NOVA Traveler 3-Wheeled might be just what you need. This unit has 8-inch wheels, and it is lightweight as it only weighs 16 pounds. Because of this, this device is considered effortless to carry and to control. On top of that, if you are concerned about the user’s safety, you should know that this product comes equipped with locking hand brakes that are effortless to utilize. Also, this unit includes a large basket, a tray, and a roomy zippered pouch where you can store all the belongings that you might need while out on a walk. Size-wise, this device measures 24.25″W x 23.75″D when opened and 33″ – 37.25″L x 26″W x 11″D when folded. Consequently, this unit is quite space-efficient. If you are a fan of models that have a simple design, you will probably like this device sold by Drive Medical. The product incorporates a padded seat that is known for being extra comfy, and it has an under seat pouch where you can safely store your possessions without fearing that somebody might take them. What is more, this device has a padded backrest so that you are comfortable whenever you take a few minutes off to rest. Besides, this unit contains 7.5-inch non-marring casters that have soft grip tires and that are perfect to be used when both outdoors and indoors. The included loop locks are easy to handle, and the brakes have serrated edges that provide the user with a firm hold. According to the manufacturer, this item can help one improve his/her mobility and overall quality of life as it can help one stay active. If you are interested in a product that was built to last, you should not overlook the Medline Steel Foldable. This item was developed from a long-lasting steel alloy. Furthermore, the unit also features a reinforced frame that can actively support people that weight up to 350 pounds. According to the seller, this unit is particularly lightweight as it only has 19 lbs. The product folds flat so that you can easily store and/or transport it, depending on the case. Besides, the 6″ wheels are said to behave well when used both indoors and outdoors. The device has grip handles that can be adjusted from 31″ to 35″ so that the user feels comfortable holding them. The width between the handles measures 17.5″. The product has a padded seat and an included backrest that enables the users to rest comfortably. The model has many happy buyers that recommend it. This device is another one that you should not ignore. This unit comes fitted with a folding mechanism that makes it easy to store and transport. Also, the product features a nylon pouch that is water-resistant. Here, you can keep all your much-needed belongings, no matter the weather. This unit has a lightweight frame and, as a result, it is known for being effortless to manage by seniors. The device also includes a backrest as well as fold-down footrests that provide the user with extra comfort. Overall, this item is height adjustable, and, as a result, it is considered fitting for most people. At the time that we have done the research on this model, the unit had excellent ratings and good reviews from current users. However, before one utilizes this product, it is crucial that one reads the info provided by the manufacturer. If you want to acquire a device that has a three-wheel design, we suggest that you consider the Drive Medical Winnie Lite. 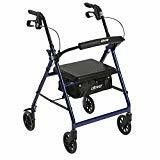 This item has a special loop mechanism that makes it quite safe to be used by seniors, as well as 7.5″ casters with soft-grip tires that make it suitable to be used on all types of terrains. The model comes fitted with a standard carry pouch where one can place all the items that he/she wants to take with him/her while on a walk. Overall, the device is said to weight no more than 11 pounds, which is considerably less than most products out there. Therefore, the model is easy to handle. Before one purchases such an item, it is best that he/she consults a physician and to seek specialized advice on how to utilize it. This way, one can avoid any unhappy accidents. According to the manufacturer, this unit contains features that make it practical as both a transport chair and a regular rollator. Among the features that recommend it are its locking armrests and the footrest, two aspects that make it suitable to be used when transporting people. Besides, this item is regarded as an easy-to-put-together unit. In fact, previous buyers have pointed out that, in order to assemble this model, one needs no tools. Additionally, this device has an easy-to-fold frame that features a locking mechanism. Because of it, you can stay assured that the unit won’t close unexpectedly. A carry pouch and a padded seat are also features that make the model practical and suitable to be used by seniors. The 8-inch casters included in the design of the product make it effortless to be used on all kinds of terrains. Another item that one should not overlook is the Healthcare Direct 100RA. This product is easy to fold and store once you are done using it. Additionally, because of its dimensions when folded, the item measures 18 D x 23.75 W x 33 H inches, this product can also be transported in the trunk of one’s car with little to no effort. Nevertheless, this device features a padded seat and an included backrest, so that you can sit on it and relax whenever you are in need of a break. As the manufacturer states, this item is safe to use and very intuitive. Most of those that have acquired this item have said that although the model comes in pieces, this device is effortless to assemble, even by those that are not mechanically inclined. 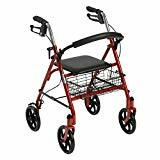 The product is a great gift for those seniors who value their independence and that still enjoy walks. 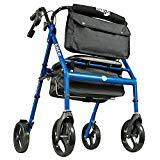 If you are still not sure what aspects to look for in a good lightweight rollator, we are here to lend you a hand. After looking at plenty of reviews and after reading what the experts had to say about this subject, we have constructed a list of features that should not be omitted. According to rollator walkers reviews, it is advisable that, before one places an order he/she gets familiar with the many kinds of products available online, as this can help him/her make the correct decision. First things first, there are the three wheel units. As you probably know, investing in the best 3-wheel rollator should be considered by those that want to gift this unit to a person that intends to use it indoors, as the front wheel of the model makes it effortless to maneuver whenever dealing with tight spaces. As a plus, you should know that, because of the design of these models, most reviews of good rollators suggest that these units are not as stable as other similar products that feature four wheels. Besides, these items usually do not come provided with a built-in seat that you can sit on whenever you grow tired of walking. Furthermore, bariatric models are proper for those type of people that are rather heavy, as most of these devices can sustain up to 500 lbs. These products are made from high-quality materials that can stand the test of time and they are generally equipped with larger wheels that prevent any type of sinking on soft ground. Besides, the four-wheel units are very popular among users. Additionally, a product of this kind is considered a good rollator for travel, as most devices are lightweight and foldable. Last but not least, if you know somebody that gets tired quickly, you should consider investing in the best rollator transport chair out there. These products are easy to utilize by seniors, and they can also be operated by a second person. This model is usually purchased by those that are recovering from surgery and are in need of a cheap rollator that is also a wheelchair. If you intend to purchase new rollators for the elderly, it is vital that, before you place any orders, you consider the weight factor. First things first, you should examine the weight of the rollator itself. Usually, the units that are less heavy are those that have been manufactured from aluminum. Therefore, check out these models before you make up your mind. Secondly, just like when purchasing a travel wheelchair, you should not ignore the weight of the person itself. As expected, not all models available are suitable for everybody. To put it simply, there are average models that can support up to 300 lbs, and then there are the heavy-duty devices that have been designed for people that are up to 500 lbs. Consequently, you should only purchase an item that fits the capacity requirements of the person that you are shopping on behalf of. Moreover, this aspects should not be ignored, as buying a model that cannot support an appropriate weight can result in the person using it getting injured. If you are determined to purchase a good rollator, you should also pay attention to a few extra features. For instance, you should make sure that the model that you have chosen is height-adjustable so that it can fit all people. This way, next time you want to surprise your grandma, you won’t have to search for rollators for short persons in particular. On top of that, all rollators for seniors that you are considering purchasing should have wide, padded seats so that the person using it can take necessary breaks whenever he/she feels out of breath and in need of a short rest. Furthermore, you should also buy a unit that has brakes. Lastly, we feel like it is crucial to we remind you that, similarly to when purchasing practical gifts for retired men, it is essential that you talk to a physician and that you make sure that the product is adequate to be used by the senior that you have in mind. On top of that, you should ask a health care provider to explain to the person using the product how to do so efficiently, so that all unfortunate accidents are avoided. Also, if you are looking for items that you could gift to a senior, we recommend that you check out this article on how to pick a senior cell phone. Additionally, this guide on senior multivitamin might also be something that you might find helpful, as it contains plenty of info that can help you make a great decision.